Everyone wears pants, but how much do you know about the different ways they can be tailored? Often overlooked in terms of styling decisions, pants have the potential to truly make or break a look. Some may think there really isn’t much to consider, but there are certain details worth noting when it comes to pants, or else they might be too long, too short, too baggy, or too tight… Having a great-fitting and well-styled pair of pants can work wonders for your outfit and for your confidence. Here’s what you need to know, from belt loop to hem. 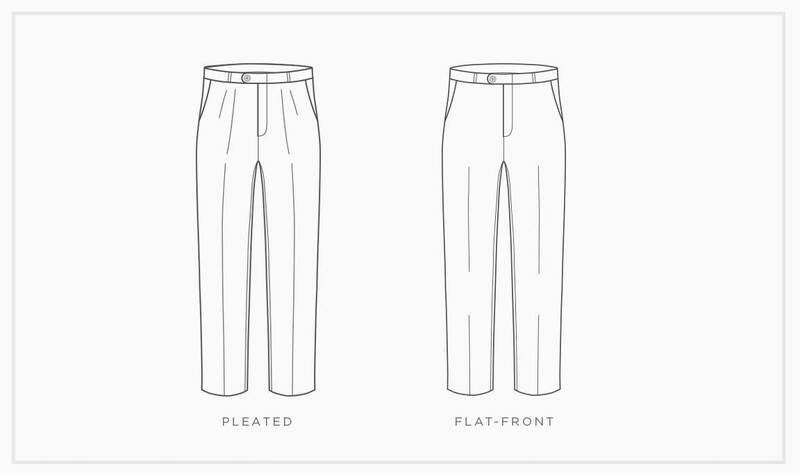 When it comes to choosing between flat-front or pleated pants, which is better? It’s commonly believed that pleats are outdated, but that all depends on who you ask, your personal style, and the fit. Pleats are pressed or stitched in place to allow for more mobility and create more room in the legs of the pants. 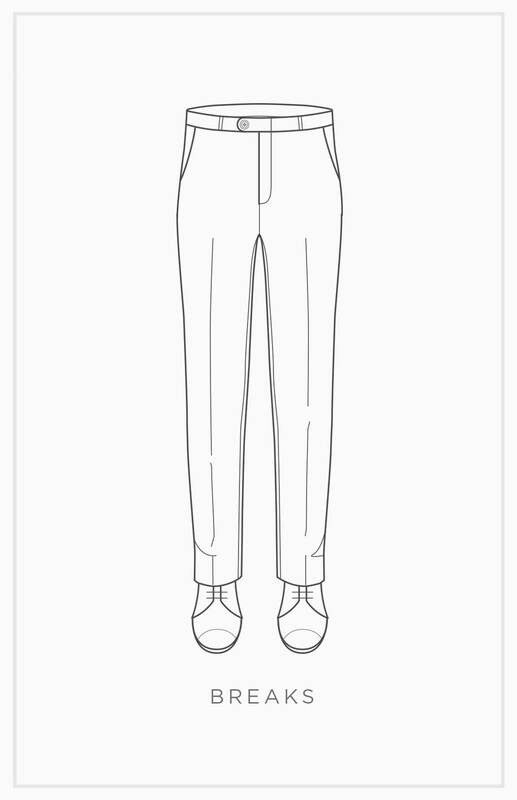 When pleats are well placed, their draping makes your legs look longer, so pleated pants can be flattering for many guys. Flat-fronts are the most traditional pant style and can be seen everywhere. This style is contemporary and will create a smooth and slim silhouette. Whether pleated or flat-front, remember: the straighter the better, and avoid anything that’s too baggy. Even if you’ve never considered the hem of your pants before, it’s still something to be aware of. The plain hem is probably what you have on most pants in your closet right now. Often paired with a flat-front pant, it’s classic and provides a clean, long line through the leg, right down to your shoe. The plain hem works for men of all builds, but it definitely makes you look taller thanks to the unbroken line it creates. The cuff hem is becoming increasingly popular and adds weight to the bottom of your pants. It often works best with pleated pants. 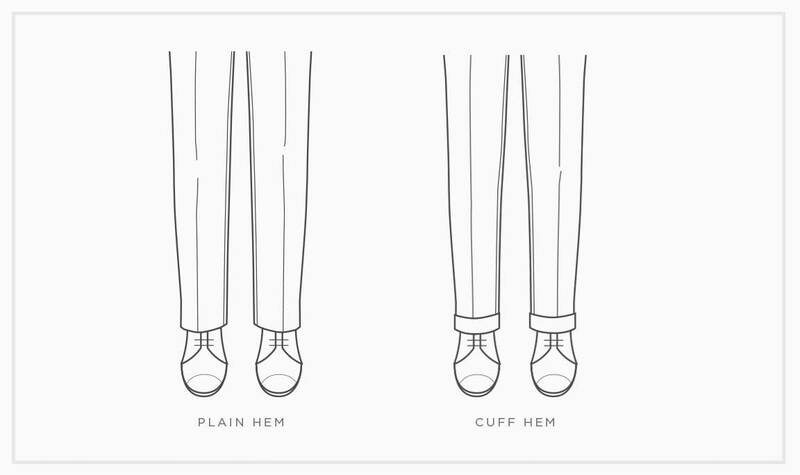 If you’re tall, cuff hems will work for you. If you’re feeling trendy, try tapered pants with a slightly raised cuff to show off the ankles. In the pants world, a break refers to how much of a crease in fabric there is at the bottom of your pants while the bottom hem rests on your shoes. It really is more of a matter of personal style, but it’s still important to choose wisely. Having no break is seen as the most fashion forward, as it usually means the pants are cuffed or cropped a bit above the shoe—perfect for a European-influenced, casual look. This is the only break that will show your socks. A quarter break straddles the line between trendy and professional, and is a good option for men who sport slim-fit trousers. Classic and mature, a half break is pretty common in your day-to-day suit and can easily be seen around the office. Lastly, a full break is the most traditional and implies longer pants as more fabric is needed to create a more pronounced crease. The final touches are belt loops, which are optional but recommended unless you’re getting a tuxedo, and braces for suspenders, which are making a huge comeback. We recommend adding braces to your pants just in case—they’re hidden anyway, and add a dapper final touch to your look on those days you want it. Looking for the perfect pair of pants? Explore all your options in one of our showrooms or online.